Blackwell, TX – Factory FMF/KTM rider Charlie Mullins remains undefeated in the AMA Rekluse National Enduro Series after earning the victory at the second round of the series. 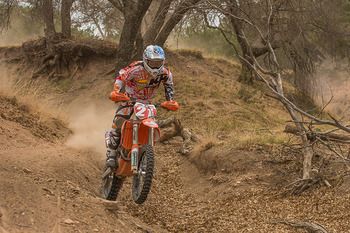 Mullins rode strong throughout the day proving that he could tackle the dry and dusty Texas terrain. He turned the fastest time in the first two special tests to get out to an early lead over the competition. Mullins unknowingly got lost in the third special test section and was docked a minute penalty after the other riders came in and the promoter realized Mullins time was off. In the fourth test, Mullins suffered a slow speed crash and hit his hip on a rock. He recovered from the crash but was unable to turn the fastest time in that section. He rebounded from that set back and went on to win the final two test sections to claim the win with a one minute and twenty-four second lead over the next closest competitor. Finishing in the runner-up position was Factory KTM support rider Grant Baylor. Fresh off of his GNCC XC2 Pro Lites win last weekend, Baylor came out swinging once again and turned fast test times throughout the day. He was able to finish 2nd overall for the event with a 25 second lead over the 3rd place ride of Andrew Delong. Factory FMF/KTM teammates Steward Baylor and Mike Lafferty struggled a bit on the Texas course. Baylor was new to the Texas terrain as he missed the Concho Enduro the previous year due to injury. His unfamiliarity set him back in the beginning of the day but as he adjusted, he continued to improve his times and made a last minute charge to improve his score and finish 6th overall. Lafferty finished right behind him in 7th place.